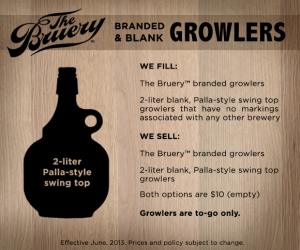 In a blog post last week, Placentia’s The Bruery announced that it was relaxing its policy on growler fills, and has begun selling and filling unmarked, two-liter Palla-style growlers. The change comes from the brewery’s interpretation of California growler regulations, of which there has been much attention paid lately. Currently, there is no standard growler size or shape, and breweries that offer them choose the size(s) and shape(s) of the growlers they sell, pretty much solely on whatever style they prefer. Sizes typically range from one liter to half-gallon (or sometimes larger), with either a screw top or a gasketed swing top. Most growlers are glass, but they can also be ceramic or made of stainless steel. Many breweries (Hangar 24 Craft Brewery, for example) sell several sizes of growlers, and charge accordingly for refills. In the past, breweries have interpreted the regulation to mean that each growler needed to be labeled with the brewery’s name and address and other information, and because of that, breweries couldn’t refill each other’s growlers. That meant that beer aficionados who frequented many breweries ended up with many different growlers. However, it seems there’s no regulation defining exactly what a label is, so by leaving the growler blank, a temporary sticker or tag could act as a label, as long as it has the information necessary (beer name, brewery name and address, ABV%, disclaimers, etc.) to satisfy current regulations. 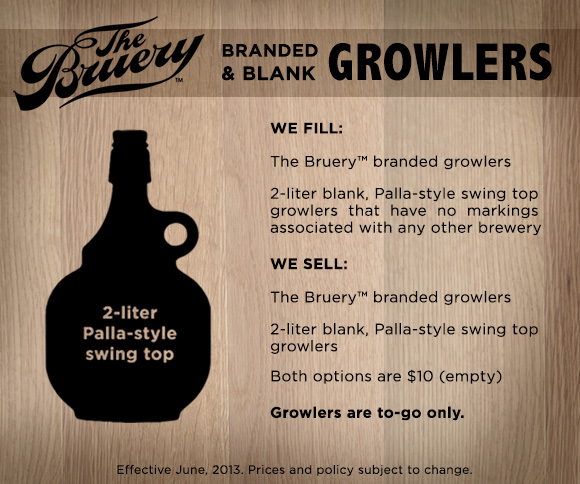 The Bruery has chosen to refill only blank, two-liter Palla growlers, and its own branded growlers, which are identical save for the label. Plus, only refilling the same size and type of growler as it has in the past makes it simple from a sales point of view. Will other breweries follow suit? Will you be able to refill that blank growler at your favorite brewery? Only time will tell, but we think this is a step in the right direction. Other SoCal breweries (Eagle Rock Brewery, Chino Valley Brewery, Stone Brewing Co.) offer that same style of growler, so they might be the first to allow you to use your “generic” growler to bring home their beer. The Bruery is selling both blank and Bruery-branded growlers for $10 at its tasting room, 717 Dunn Way, Placentia, and will refill either. Click here to read the Bruery’s explanation of its new growler refill policy, along with tips on removing the silk-screened label from your current Bruery- (or other brewery) branded growler. This entry was posted in Orange County breweries by John Plessel. Bookmark the permalink.